It’s a night like any other on board the Icarus. Then, catastrophe strikes: the massive luxury spaceliner is yanked out of hyperspace and plummets to the nearest planet. Lilac LaRoux and Tarver Merendsen survive. And they seem to be alone.Lilac is the daughter of the richest man in the universe. Tarver comes from nothing, a young war hero who learned long ago that girls like Lilac are more trouble than they’re worth. But with only each other to rely on, Lilac and Tarver must work together, making a tortuous journey across the eerie, deserted terrain to seek help.Then, against all odds, Lilac and Tarver find a strange blessing in the tragedy that has thrown them into each other’s arms. Without the hope of a future together in their own world, they begin to wonder - would they be better off staying in this place forever?Everything changes when they uncover the truth behind the chilling whispers that haunt their every step. Lilac and Tarver may find a way off this planet. 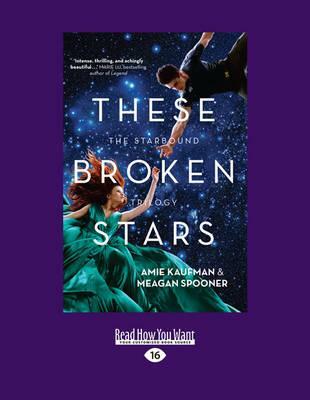 But they won’t be the same people who landed on it.The first in a sweeping science fiction trilogy, These Broken Stars is a timeless love story about hope and survival in the face of unthinkable odds.